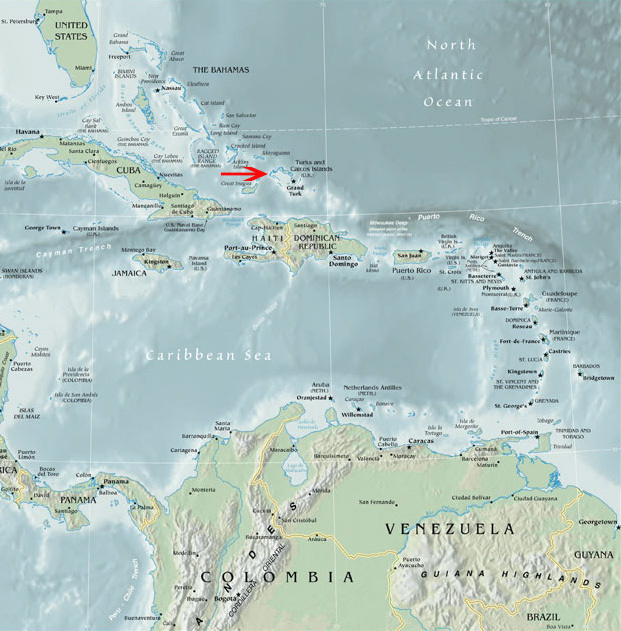 The Turks & Caicos Islands are a British Crown Colony consisting of 40 islands and cays, only 8 of which are inhabited. 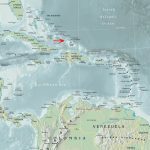 They are located 550 miles southeast of Miami, and lie southeast of the Bahamas, east of Cuba, and north of the Dominican Republic & Haiti. 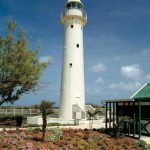 The islands of Providenciales and Grand Turk are the main centers of tourism and serve as perfect bases for your diving adventures. 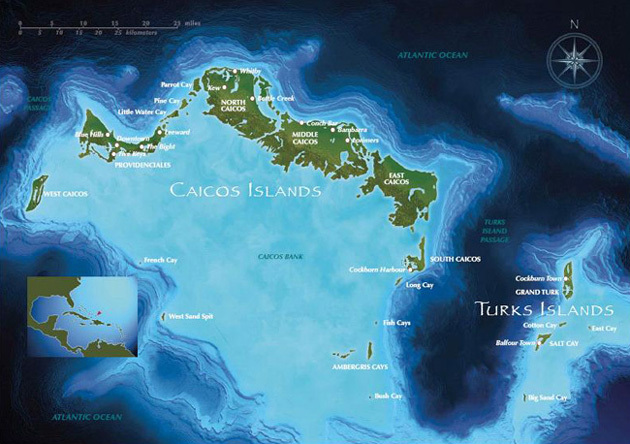 The Turks & Caicos Islands are surrounded by a 200 mile long, 65 mile wide coral reef system. This pristine reef system boasts an abundance of marine life that is made even more enjoyable by the near perfect diving conditions. Water temperatures range from 74-78 degrees in winter and 82-84 degrees in summer, and visibility can sometimes reach up to 200 feet! 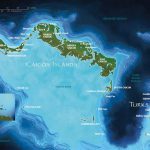 Much of the reef system starts just offshore in shallow turquoise waters, and in many places it drops off into an exceptional wall that begs exploration. 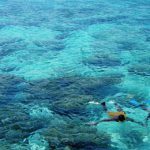 Expect colorful sponges and corals, eagle rays, mantas, turtles, dolphins, and an impressive variety of tropical reef fish. 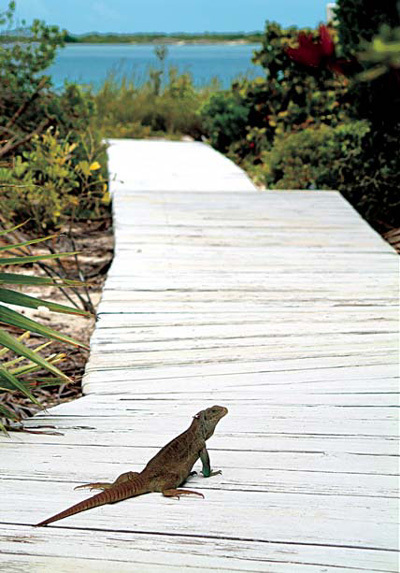 These islands are full of opportunities for the eco-explorer. 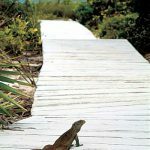 There is an impressive chain of limestone caves on Middle Caicos, a unique Rock Iguana sanctuary on Little Water Cay, whale watching excursions off of Salt Cay, excellent bird watching from the tidal flats of North Caicos, and much, much more. Dive Provo’s PADI Five Star dive center is located at the Ports of Call shopping complex, which is adjacent to Comfort Suites & centrally located to all of the Grace Bay area resorts. Divers enjoy complimentary transfers from their hotel to the dive shop and to the docks to meet the dive boats. In addition to a solid supply of rental gear, the dive shop carries snorkeling equipment, shirts, bathing suits, hats, sunscreen products, sundries and a variety of gift items for purchase. Dive Provo operates 3 modern boats. The Provo Conquest (left) & Provo Crusader are both 36 ft Newton dive boats with plenty of shade and a comfortable seating area up top with the captain. The Provo Challenger has a slightly narrower beam and is a favorite for private charters. Dive boat amenities include showers, rinse tanks, platform & ladders, VHF radio and safety equipment. Fresh drinking water, flavored drinks and snacks are available free of charge on all dives. A light lunch is provided for the longer south side trips. 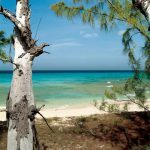 Dive Provo offers daily 2-tank dive trips to Northwest Point, West Caicos, French Cay, Pine Cay, Sandbore Channel or Grace Bay. Dive boats depart from the docks at Turtle Cove Marina for diving along Provo’s north shore, and from a dock on the south side of the island for trips to West Caicos and French Cay. Pick up time at the various hotels is 8:00 am, returning to your hotel any time between 1:00 & 3:30 pm depending upon the destination. The south side trips have the later return times. Single tank dives in Grace Bay are also scheduled every afternoon at 2:00 pm. 3-tank dive days, snorkeling trips, night dives and private charters are also gladly arranged on demand. After each dive the staff takes care of all gear; cleaning it, storing it at day’s end, then delivering it to the boat for the next day’s outing. Dive Provo is a PADI 5 Star Resort, an SSI Partner in Paradise and a Universal Referral training facility. A full range of courses and certifications is offered. Nitrox (and Nitrox certification) is available. Dive Provo is dedicated to providing guests with convenient and trouble-free diving. The professional Dive Provo staff knows that experienced divers want the freedom to plan and execute their own dives, explore at their own pace and enjoy the reef without having to follow a group of other divers. Newer divers are offered advice on buoyancy control and navigation and may prefer to follow the guide in the water, but most soon learn that they see more underwater and enjoy the sport more if they are allowed to control their own dive. This philosophy of diving freedom has ensured Dive Provo a core repeat clientele and many word of mouth recommendations. This site, located 27 miles southeast of Provo, features a 50 ft stretch of open sand and a wall at 60 ft. The sand area is home to stingrays, triggerfish, and a variety of pelagics. 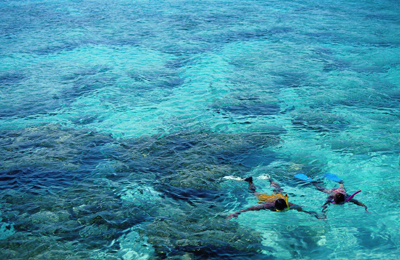 The vibrant and healthy reef attracts large schools of goatfish, jewfish, and more than 120 other species. This vertical wall starts at 50-70 ft and features gorgonians and enormous barrel sponges. Frequent sightings of sharks and eagle rays. Gently sloping corals give way to a dramatic drop-off which is frequently the backdrop for grunts, snapper and groupers. More schooling grunts & snapper can be found at this spur and groove wall. A search of the area will reveal many other interesting characters. This wall is undercut to a depth of about 100 ft. The prolific reef at the very top of the wall features some impressive stands of pillar coral. You’ll see barracudas, parrotfish, angelfish, Nassau groupers & more. Look for a large anchor embedded in a crack in the wall at 70 ft. This dive begins with coral heads scattered around a patch of sand. A sand chute through the reef at 50 ft leads to the ledge of a drop-off at around 80-100 ft. The ledge boasts some excellent plate and star corals and the wall is covered with black coral and purple tube sponges. You’ll encounter sharks, groupers, black durgons and more. 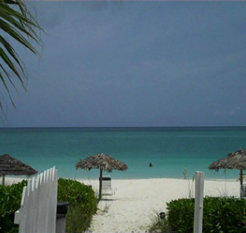 Ocean Club & Ocean Club West are located less than a mile apart on Grace Bay Beach in Providenciales. 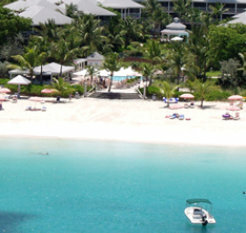 Guests of one resort are invited to enjoy the facilities, amenities, and dining delights of both resorts. Ocean Club offers a wide variety of casually elegant suites, all with a tropical decor. Choose from a Studio, Studio Deluxe, Junior, One Bedroom, Two Bedroom, or Three Bedroom Suite. All suites feature air-conditioning, cable TV, complimentary internet access, direct dial telephone, hair dryer, in-room safe, and iron & ironing board. Studio Suites (left) feature an island view balcony or patio & a kitchenette with refrigerator, sink, coffee maker, microwave, and 2 burner range or electric skillet. Studio Deluxe Suites (below) feature 2 double beds, a furnished screened balcony or patio with island view, and a kitchenette. Two Bedroom Suites feature a full kitchen, dining area, living room with fold out queen size sofa bed, master bedroom with king size bed, second bedroom with two twins, 2 1/2 baths, expansive screened balcony or patio, and a washer/dryer. 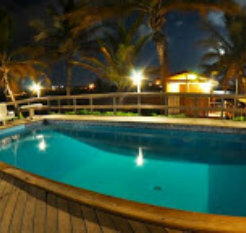 Choose from Ocean View, Garden/Pool View, or Beachfront. Three Bedroom Suites offer all of the above plus a third bedroom with a king size bed and 3 1/2 baths. Choose from Ocean View or Beachfront. 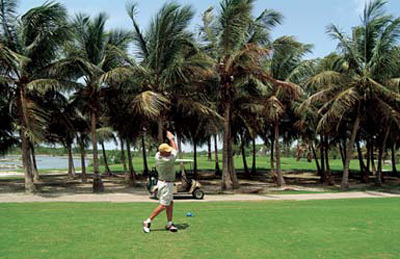 Ports of Call Resort is located right across the road from Grace Bay Beach in Providenciales. A recently-renovated central building features a welcoming reception area, business center, breakfast room, fitness room & poolside bar. 98 spacious Junior Suites are located in two three story buildings surrounding a lush tropical pool area. A designated beach area complete with lounges and Tiki-huts is 300 yards away. A complimentary shuttle runs each hour. 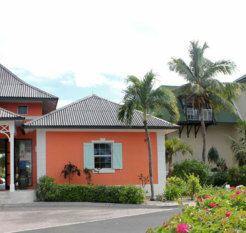 Dive Provo’s PADI five star dive center is located at the Ports of Call shopping complex, adjacent to the hotel lobby. 59 Standard Junior Suites (left) feature a king or two double beds, sitting area with pull-out sofa, table & two chairs, individual air conditioning, 32″ flat screen TV, mini-refrigerator, coffee maker, iron & ironing board, in-room safe, and hair dryer. Some of the suites offer balconies or poolside terraces. 39 Deluxe Junior Suites (right) offer all the amenities of the Standard Junior Suites with the added bonus of a recent renovation (Dec 2011). This luxurious Caribbean Colonial style resort is nestled along the white sands of world famous Grace Bay Beach in Providenciales. The resort offers oversized Studio Deluxe Suites, One Bedroom Deluxe Suites, and Two Bedroom Deluxe Suites. Choose from Ocean Front, Ocean View, or Botanical View. All suites feature a/c, ceiling fans, iPod docking stations, complimentary high speed internet access and more. The popular Studio Deluxe Suites (left) feature a spacious balcony with comfortable deck furniture, 12 foot sliding glass doors, sleek kitchenette with fridge, microwave, coffeemaker, sink and full compliment of utensils and tableware, washer/dryer, closet safe, dark wood king or queen bed, armoire with cable TV and DVD player, sitting area and bathroom with deep tub and high end amenities. The One Bedroom Deluxe Suites (right) feature a king bed, large closet, wraparound balcony with comfortable deck furniture, spacious sitting area with pull-out couch, chairs, armoire containing TV and DVD player, writing desk, & sideboard with wine rack and full kitchen with modern appliances, utensils and tableware. Many of the Studio & One Bedroom Deluxe Suites were designed with a common foyer that when used, creates a Two Bedroom Deluxe Suite with two bathrooms. 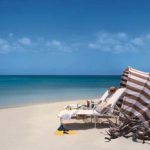 Located in a prime spot on Grace Bay Beach, and offering just 28 rooms, Sibonne Beach Hotel is the perfect choice for an intimate and relaxing getaway. Room categories include Standard Courtyard Garden Rooms and Balcony Ocean View Rooms, as well as 2 Value Rooms, 2 Premier Oceanfront Rooms, and 1 one-bdrm Beach Apartment. All rooms feature air conditioning, ceiling fan, cable TV, mini-fridge, ice bucket, coffeemaker, direct dial phone with data port, wireless internet, in-room safe, iron & ironing board, hair dryer and clock. The Standard Courtyard Garden Rooms are all on the first level of the hotel (lower level in photo to the left). These rooms feature a king or two double beds and a sitting area outside the sliding glass door that looks out on the lush garden. The 2 Value Rooms are very similar to the Standard Courtyard Garden Rooms, the major difference being that the Value Rooms are entered directly from the courtyard and neither one has an outdoor sitting area. They are connecting, however, and each one enjoys a queen or two twin beds…a great family option. The Balcony Ocean View Rooms (right) are all on the second level of the hotel (upper level in photo above). They enjoy a king or two double beds and a balcony with a view of the courtyard gardens and the ocean beyond (below). 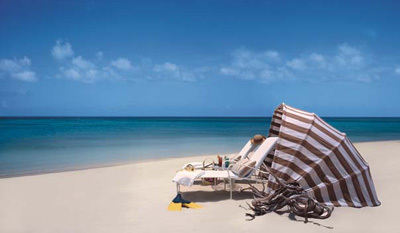 The 2 Premier Oceanfront Rooms are situated directly in front of Grace Bay Beach. Each features a queen bed, upgraded furnishings, and a private outdoor terrace with lounge chairs. The one-bedroom Beach Apartment is located on the second floor and boasts a private terrace, a screened dining porch (left), a full kitchen (with pots, pans, plates, etc), a living room with dining area, a sleep-sofa, and a separate bedroom with king size bed. You’ll feel as if you have your very own beachfront cottage! 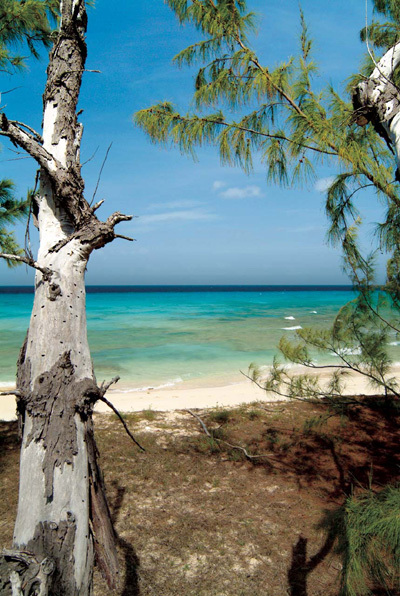 Just a 10 minute drive from Grand Turk Airport, and right on the beach, you’ll find Osprey Beach Hotel. This relaxing hotel offers 27 beachfront rooms and 10 Atrium rooms that overlook a tropical courtyard. All beachfront rooms feature a private ocean view balcony or patio, air-conditioning & ceiling fan, cable TV, telephone, iron & ironing board and hair dryer. Choose from a Beachfront Premier King Suite, a Beachfront Premier Queen Suite, a Beachfront Queen Suite, or a Beachfront King Room. The Beachfront Premier King Suite (above) features a king bed and mini kitchen with refrigerator, microwave, toaster, silverware, dinnerware and coffeemaker. Both the Beachfront Premier Queen Suite (left) and the Beachfront Queen Suite feature two queen beds and a full kitchen with refrigerator, microwave, toaster oven, stove top, silverware, dinnerware, cooking utensils, pots & pans and a coffeemaker. The Beachfront Premier Queen Suite offers slightly upgraded furnishings. The Beachfront King Room (right) lacks a kitchen but does offer a mini fridge & coffeemaker. Also available are 10 Atrium rooms (below) just a few yards from the beach. The 6 Atrium Balcony Rooms (left) share a large balcony overlooking a tropical courtyard and feature either a king bed with twin daybed or two queens. The 4 Atrium Courtyard Rooms offer a queen size bed and a ground floor courtyard view. All Atrium rooms feature a/c, ceiling fan and mini fridge. Free wifi is available in the courtyard. This romantic restaurant is at the Grace Bay Club facing Grace Bay Beach. You’ll dine beneath a thatched-roof palapa lit by candles, torches and starlight. Menu features many delicious seafood dishes. Open 6:30-9pm. Reservations recommended. This restaurant is located right on the beach at Sibonne Beach Hotel. It’s a great option for casual, yet hearty Caribbean cuisine. Try the conch fingers. Open all day long. Reservations recommended. This beautiful restaurant is set high on a hill overlooking the twinkling lights of Turtle Cove. The menu features an eclectic fusion of Mediterranian, Asian and International flavors. Open Tues-Sun from 5-10pm. Located at the Miramar Resort. Reservations recommended. 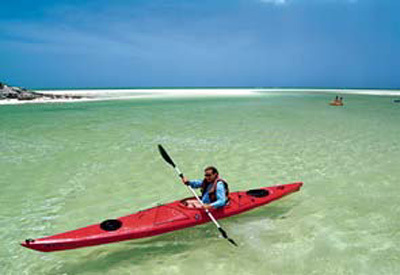 This hot spot is located right on the beach at White Sands Beach Resort. Cracked conch, coconut shrimp, lobster tail and more! This casual, open-air beach bar serves burgers, lobster quesadillas, shrimp & chips and more. Wonderful ambiance & excellent Chinese cuisine! Located at the Salina Houses. 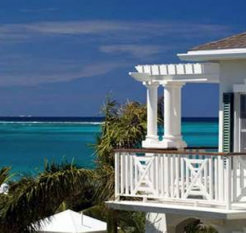 Where are the Turks & Caicos located? How long are the flights to Turks & Caicos? Flying from LAX to Providenciales takes about 8 hrs, 15 mins. From JFK a 3 hr, 40 min nonstop flight is available. 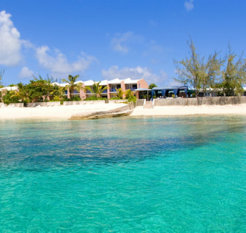 If Grand Turk is your final destination, an interisland flight on Air Turks & Caicos will have you there in 25 minutes. 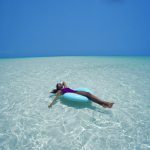 What airlines fly to Turks & Caicos? 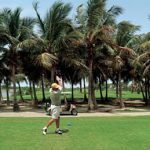 You’ll be on a Boeing 767 from LAX to Miami and a Boeing 737 from Miami to Providenciales. The nonstop flight from JFK to Providenciales is on a Boeing 757. Interisland flights are on an Embraer Brasilia EMB120. The 767’s have a 2-3-2 configuration. The seats are AB-CEG-HJ. The 737’s and 757’s have a 3-3 configuration. The seats are ABC-DEF. The EMB 120’s have a 1-2 configuration. The seats are A-BC. 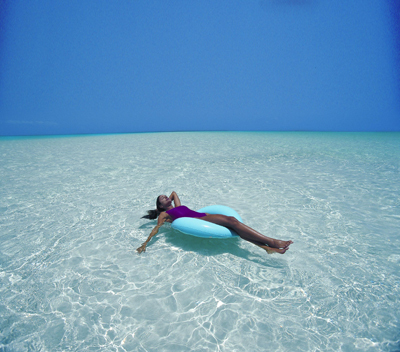 Turks & Caicos is in the Eastern Standard Time Zone. Daylight Savings Time is observed from April to October. From Provo, boat rides to Grace Bay take about 20 minutes, boat rides to North West Point and Pine Cay take about 50 minutes and trips to southern sites take a little longer. 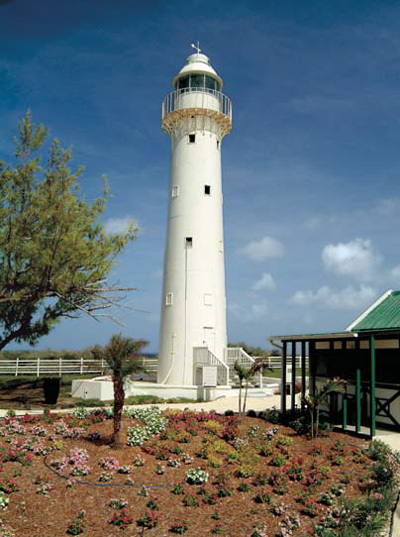 From Grand Turk, the furthest dive site is 15 minutes away. 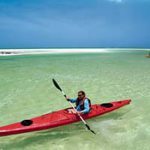 Dive Provo – Boats typically depart at 8am for a two-tank morning and return between 1:00 & 3:30 pm depending on the dive destination for the day. Lunch is provided on the longer trips. Single tank dives in Grace Bay are also scheduled every afternoon at 2:00 pm. Provo Turtle Divers – A typical dive day consists of a two-tank morning, although afternoon & night dives may also be arranged. Oasis Divers – Two morning boat dives per day plus unlimited shore diving is the norm. Afternoon dives may also be arranged.